I still own a few shares of GOOG. It’s felt overpriced recently, but I’m holding onto a minimal amount at all times and trying to add more over time. So I’m hoping the price drops a bunch so I can pick up more cheaply. Do a search here for GOOG for my previous thoughts (years old), but I basically think that the world will continue to be drowned in data. Google’s goal to organize the world’s information and their expertise at scaling Internet apps puts them in a great position to be a contender in just about any future technology. Anyway, I’ve recently read Phil Town’s new book Payback Time. The title there, like most investing books lately, takes advantage of the recent drop in the stock market to entice readers. However the content and tone of the book isn’t as whiny as you might think, and is generally applicable to investors in all markets. We were big fans of the first Phil Town book, Rule #1, mostly because it described things in layman’s terms and gave readers a clear method for putting the books theories into practice. 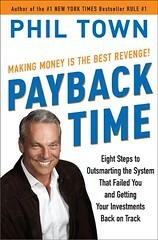 Payback Time works the same way and repeats a lot of the ideas in Rule #1. There are still the 4 M’s (Meaning, Moat, Margin of Safety, and Management) for example, but instead of using technical analysis (in the form of Rule #1’s red/green arrows) Payback Time recommends a form of dollar cost averaging, Town calls “stock piling”. Of course, Town has a section in the book titled “Why This Isn’t Dollar Cost Averaging” that I’ll try to summarize here. Town says (emphasis his), “DCA means investing a fixed dollar amount at fixed intervals no matter what the price of a given stock.” He then goes on to list the numerous flaws and criticisms of dollar cost averaging. So Town calls stockpiling “DCA with a brain”. You don’t buy any time or on predefined schedules. You buy when the stock price is within your Margin of Safety. And you don’t hold indefinitely. You sell if the stock price goes about your Margin of Safety. I’ll buy that. And I like this a little better than using “the tools” or “the arrows” or technical analysis to judge a stock because it’s one less thing to calculate. If you are calculating a “sticker price” and MOS price anyway, might as well use them to trade. If you thought of stocks as commodities or discounted dollars, this kind of trading would make even more sense. I value $1 at $1. If the market is pricing it at $0.80, I buy. If the market is calculating it at $1.10, I sell. Sure I could have waited for the price to drop to $0.70 before buying, or $1.20 before selling. I would have made a better trade, but I’m always making a winning trade if I buy when the price is lower than what I value it at (plus my MOS) and sell when the price is higher than I value it at. So the Payback Time strategy should be a little easier to follow than the technical analysis from Rule #1. Well, to a certain extent. Town introduces another calculation called “the payback time” (maybe that’s the true meaning of the title) to pretty much calculate the MOS from a different angle. And he brings technical analysis back in, talking about support and resistance levels. Here’s a good recent analysis from Hipegg on Google. Alright, so that out of the way, let me share some of my calculations on Google stock (GOOG). I’m basically running through the Payback Time Spreadsheet found on the Payback Time website. It’s a handy tool. Here I would want to do a large Google Moat analysis, but I’m lazy. So I’ll say hey, they have a huge margin and virtual monopoly in search. And while there stance is vulnerable (MSFT is gaining ground lately), this moat is fairly stable because (1) it takes a lot of knowledge and investment to serve billions of searches a day quickly and (2) advertisers and publishers benefit from consolidation and drive the market towards one winner. Charlie Munger and Warren Buffet at Berkshire Hathaway like Google’s moat. Not sure if they are investing. Buffet shies away from tech. Here I would want to do a large Management analysis, but I’m lazy. I’ll say hey, these guys strive to do no evil. Page and Brin seem like great folks who are in it for the long term. They are standing up to China vs. going for short term profits. They don’t fudge their numbers (other than tweaking the Adsense lever). They don’t mess around with finance gimmicks like splits, etc. They are smart and clearly have a better understanding of the future than the average C-Level exec. * 5 year EPS Growth has averaged 34%. * 3 year OPS (operating cash flow per share) Growth has averaged 17%. * 5 year Sales Growth has averaged 40%. * 5 year BVPS (book value per share) Growth has averaged 58%. Nice all around. You usually want to go as far back as you can on these numbers. We can’t go much further back than 5 years because Google only started trading in 2004. If you wanted to be more conservative, you could use more recent (last 2-3 years) numbers since Google basically went from nothing to a top 10 company in 2 years and since then has grown a little slower. Nice again. BTW, you can get some of these numbers in chart and spreadsheet form at YCharts. Now, let’s calculate a sticker price and MOS. So according to this, I am a seller above $483.18 and I am a buyer under $362.39. For completeness, here is the Payback Time Analysis using these numbers. To recoup my investment in 8 years, I’d want to buy GOOG at $331.43. That basically means that if you bought all of GOOG at $331.43, you would earn that back in Revenues (assuming our growth numbers) in 8 years. That would be a good investment if you were buying a franchise, and should be a good investment when buying stock as well. I hope this was informative. Feel free to pick apart my numbers. In particular, I am always interested in pondering what a company that grows at 14%+ for 10 years would look like in the future. I’ll do that in a future post. This entry was posted in Fundamental Analysis, How to Invest, Reviews, Stocks and tagged Berkshire Hathaway, Business, Dollar Cost Averaging, Google, Investing, Stock market, Technical Analysis, Yahoo. Bookmark the permalink. To Disclose or Not Disclose? BTW, those Fast Money guys don’t seem as concerned about disclosing their positions or trading under altered rules like Jim Cramer is. It’s tough though. If you disclose, your trying to pump/dump stocks. If you don’t, you’re hiding stuff. I think the reason why the Fast Money people don’t mention all of their holdings is because they are traders/investors. It’s like Buffett where he only mentions things after they have occurred. Is disclosure a problem? Or is transparency the problem as some people would like us to believe it is? For example many say that had they had transparency then we would not be in this sub-prime and credit mess. In the book Demon of Our Own Design a case was made that transparency is a bad idea. Of course you might not believe me, so instead of arguing some abstract theory I will use one example where transparency hurt, and another example where lack of transparency helped. LTCM held huge positions and Scholes (one of the founders of LTCM) has long argued that the actors were not acting properly. His main argument was that people knew the positions of LTCM and were acting against them. The counter parties were bleeding LTCM more than they should have. While I have argued against Scholes, he is quite correct in his assertion that the counter parties were behaving incorrectly. They were behaving incorrectly because they had market knowledge about the counter parties. Think of it as follows. You are at a poker game and you have made a huge bet. Then while betting your opponents figure out your hand. They can bleed you dry because they know you can’t bluff or get out of this in any easy way. An example of lack of transparency happened recently. A rogue trader in France held positions of around 70 billion euros (more than twice the valuation of the bank itself). The bank liquidated the positions in the space of three days taking the markets down for a dive. Nobody knew why the market was going down, but they sold as well and overall the European markets dropped by 7%. One could argue because of this drop and lack of transparency the Fed dropped interest rates. The Fed did something that they should not have. But before we become too hasty to judge, let’s think of an alternative future. Imagine the bank came out with the position of 70 billion Euros. How would the market react? The market would dry up faster than a sponge on a midday in Death Valley. All of the actors in the market would stop buying and wait for the selling to begin. They would wait and let the bank fall because they know the bank has huge positions that need to be liquidated. You can argue that with transparency the losses tend to increase. I even wonder if the problem of our current credit market is due to the fact that the banks know about each other’s positions and are abusing that knowledge and not lending? If you are bank and you know the other bank has a huge position would you help out your competitor? Not likely. What you should actually argue is not disclosure or transparency, but knowledge. Disclosure and transparency are cope outs for those that don’t want to think. When you read my blog do you trust me? Do you trust me to be honest and ethical? If I was to disclose my holdings would you trust me then? The real question is why are you basing your trust on whether or not I disclose my holdings? And if you say, “yes it is” then I have succeeded in gaining your trust. And let me tell you once I have gained your trust I do not intend to break it. Trust is hard to get and easy to break. People forget that and disclosure or transparency is not going to help that. NOTE: You could say that how can you trust me if I don’t disclose? I say just read my blogs and keep thinking critically about my information. And if you do that, I have accomplished something that I was hoping I would, namely thinking critically. Crystallex International Corporation … announced today that, subject to receipt of all necessary regulatory and shareholder approvals, it has agreed to amend the terms of certain unlisted common share purchase warrants … held by two holders in the United States. The proposed amendment is in relation to 2,272,727 Warrants originally issued by the Corporation as part of an issuance of 4,545,455 special warrants (each special warrant consisting of one common share and one-half of one Warrant) completed on August 29, 2003. Each Warrant entitles the holder thereof to acquire one common share in the capital of the Corporation at an exercise price of US$2.75 per share until September 15, 2006. I can’t say we weren’t warned before. Robutnic pointed this out back in April in a comment to my original post here. TerryB responded in the comments, that these guys with the warrants aren’t normal investors. So they wouldn’t be so inclined to sell right away. Understandably, the stock dropped 50% yesterday (which makes sense if they’re looking at 50% of the profit) then had a decent rebound to close just over $3. As I write this, the stock is plummeting again and trading at the $2.50 level. …we have received no request or proposal for any change to our operating contract. And doesn’t say anything about the special warrants. What does all this mean? Where will the stock go? This is speculation at its craziest. This could be the begining of the end for this company. Can we trust the management? On the other hand, if the rumors are just rumors, this is a great buying opportunity. I’m getting tired of this trade and working on my exit strategy. More on that later. – The article I wrote when I first purchased shares: Cramer’s Crystallex Play. Investing can be tough some times. Wouldn’t it be great if you just won the lottery? Man, that would set you for life. Seriously. Now, we’re not suggesting you run to the closest mini-mart with your life savings. The odds of winning the Big Game (a multi-state lottery open to adults in Massachusetts, Maryland, Georgia, Illinois, Michigan, New Jersey, and Virginia) are roughly 70 Million to 1. That is only slightly better than your chances of making money going long on Overstock.com. So we all know playing the lottery is a suckers game, but does that mean you should avoid it entirely. The question came up for me when a group at the office I work at started a lottery pool. These are “clubs” where co-workers pool money together in order to increase their chances of winning. If the group (with about 20 members now) hits the $300 Million jackpot, they’ll split it 20 ways. Cut $300M in half for taking the cash option and split it 20 ways, and you get $7.5 Million per person. Not too shabby. Well, imagine laying standard playing cards end to end from New York to San Francisco. The underside of just one of those cards is marked. Start to drive across country, and at some point stop and pick up a card. If you’ve chosen the marked card, you win the jackpot. Chose any other card and you lose. How much would you be willing to pay to play this game? In terms of the odds, you’ve just played the Big Game. However you look at it, the odds against winning the Big Game jackpot are truly staggering. Does that mean that the best strategy is not to play at all? Oddly enough, the optimal strategy is to play, but to restrict your wager to an amount of money that is truly of no value to you. Optimal strategy #1 is to play the lottery with a sum of money “that is truly of no value to you”. $3 a week is right about at my “no-value” level; so I shouldn’t feel bad blowing it on the lottery. In addition, $3 is well worth the entertainment I get from anticipating the results and the comradeship that is created by sharing the moment with my co-workers. So what is optimal strategy #2? While strategy #1 focuses on minimizing the impact to your finances (in perception at least), strategy #2 will focus on maximizing your odds to win. To understand this strategy, I’ll describe a very simple lottery scenario. The PA State Lottery Association has gone crazy. They’ve setup a lottery in which the drawing is of just 1 number, ranging from 1 to 3. In any given day, the lotto number could be 1, 2, or 3. Let’s figure the odds if you played $1 (or 1 entry) per day for 3 days. This is easy to do; just multiple the chance of losing in any given day by 3 and subtract that from 1. 2/3 * 2/3 * 2/3 = ~0.3 or a 30% chance of hitting nothing over 3 days. 1.0 – 0.3 = 0.7 or a 70% chance of winning over 3 days. What if you just played $3 on the first day? Obviously your chance of winning would be 100% since you could cover all 3 numbers. The lesson here is that playing all of your lottery budget in one drawing is going to get you better odds that playing every day or every week. Now don’t get too excited. The difference in chance of winning using this strategy goes down the larger the possible combinations are. So you’re not going to increase your chances of winning the Big Game by 30%. Let’s do some calculations to see how much you would increase you chances by playing $156 in one drawing rather than $3 per week. What gives here! Well, turns out that my calculator (Excel) can’t even tell the difference in strategies with these huge numbers. But if you’re an astronomer (astrologers have their own strategy by the way) or used to dealing with really big numbers, you might be moved by strategy #2. Also notice that strategy #2 goes completely against strategy #1. $156 is an amount of money that has meaning for me. So it would be hard to part with on a long-shot gamble. Hopefully we here at InvestorGeeks and others in the blogging community can help you think of some more fruitful things to do with your money. But you also shouldn’t feel bad playing a few bucks each week as long as you won’t miss the money. Good luck. This entry was posted in News & Interest, Personal Finance and tagged . Bookmark the permalink.